Welcome to St. Catherine High Alumni Association, SE USA, where "Prayer and Work Conquer All"
An active alumni community is vital to our school's success. 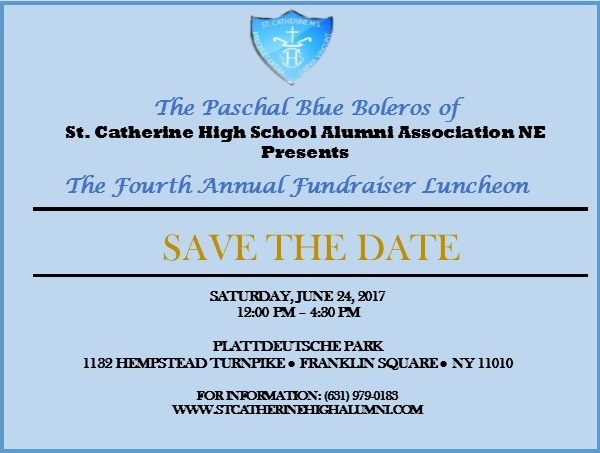 Founded in 2009, the St. Catherine High School Alumni Association, SE USA is your source for SCHS contacts, information on Alumni activities, and updates on Alumni events. Former students are automatically members of this special community, and we are glad to have you here! Our goal is to provide a sustainable network that makes it easy for you to reconnect with friends and to develop a relationship with your alma mater. An active alumni community is vital to our school's success. Governed by a volunteer Board of Directors, the Alumni Association is committed to encouraging lifelong education, providing quality services and programming and assisting in the continued development and enhancement of St. Catherine High School. An important part of our success is keeping you engaged and informed. We strongly encourage you to get involved and assist in one of the various committees in place. Most importantly, this act of giving back to the school will benefit our great Alma mater, our foundation for higher learning that helped shape our lives.